Rian Thaan Baaramee Luangta Maha Boowa Wat PaBarnTat BE2547. Silver Longya material, made 299 pieces only. One of the most famous rian from Luangta Mahaboowa, well recognized. Attached with Silver Longya Waterproof casing. Lop Om Nur Phong Brom Thong Luang Phor Unn Wat Tankong BE2548. Luang Phor Ngern Job Yai Wat BangKlan BE2545. Nur Ngern. It comes with original temple box. 5th January 2002, pouring ceremony held in front of Wat Suthat Bangkok. 25th April 2002, blessing ceremony by many monks. 3rd – 5th October 2002, 3 days 3 night blessing ceremony in Wat Bangklan Pichit. Rian Ruay Ngern Ruay Tong Luang Phor Ruay Wat Tako BE2556. Nur Thongdeang Uncut Version. 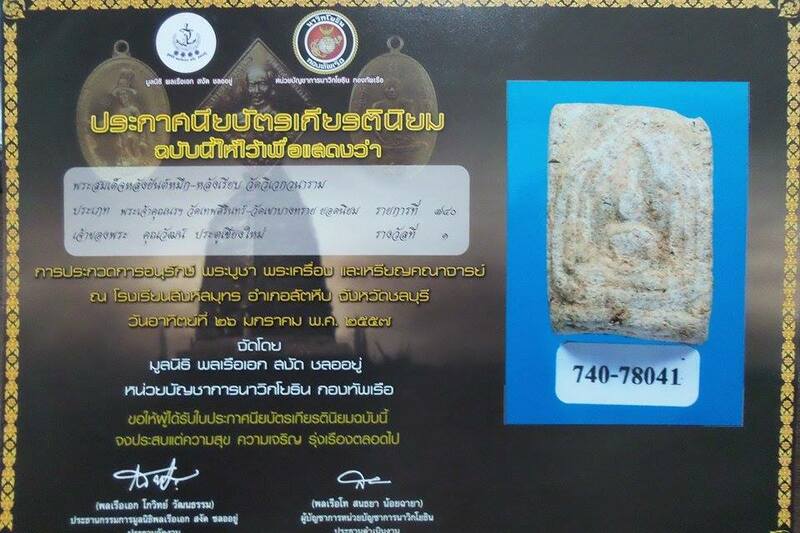 It won No2 Placing in Thailand Nakhon Pathom Grand Amulet Competition on 14th May BE2560. 9″ Bucha Phra Fang Marwichai Sorng Kreung Jakapat Rach Wat Benchamabophit BE2552. Made 99 pieces only. In BE2549 Buddha image casting ceremony by His Royal Highness Princess Phra Maha Chakri Sirindhorn. In BE2551 chanting ceremony by His Royal Highness Crown Prince Maha Vajiralongkorn. Blessed by Luang Phor Thongkam (Phra Su Thamyan), Kruba Say, Luang Phor Khaek, Luang Phor Daeng, Kruba Phat and others. The Original Buddha image is made by the King Phra Chao Fang in Chiangmai. Later on King Taksin moved the Buddha from Chiangmai to Wat SawangKhaBuri Uttaradit. During the Era of King Rama 5, He moved Bucha Phra Fang from Wat SawangKhaBuri Uttaradit to Wat Benchamabophit. Size: Height 21 inches, knee to knee 9 inches, base 13 inches. Rian Roon Somdej R.E.196 (Rattanakosin Era 196 Years Batch), Luang Phor Khao Wat ThamKhlongPheng BE2521. Phim Yai, Nur Nawa. The objective of consecrating this medallion of Luang Pu Khao Analayo R.E.196 was to present this batch of amulets to the King and in return, to create great merits for the prosperity of the people and the country of Thailand. Many different groups of people were involved in this grand ceremony and many lay-people participated in the work involved. The medallion of Luang Pu Khao Analayo was also created as a follow up to the great ceremony of consecrating the medallions of Luang Pu Waen Sujinno Roon Tun Klao C.E. (Chula Era) 1338 on the 11th of December B.E.2519, also to be presented to the King. The medals of Luang Pu Waen were so popular that they were completely distributed to the people and many devotees swore by the amulets for their miracles. As the words and experiences spread, many people who missed out on Luang Pu Waen’s medals wanted them and in answer to the people’s request, the medals of Luang Pu Khao were also created for this purpose. The council members responsible for this project initially had to convene in a meeting to decide on which Buddhist master’s image should be used. The criteria was that the Guru monk must be of high reverence by the public, who lives his monastic life diligently and observing the precepts, does charitable works and propagates Buddhism, is of compassionate nature and of high Dhamma practice and most importantly undistracted by city life. It is natural that the general public will think of the great meditation master Acharn Mun Bhuridatto and the choice was narrowed down to his disciple Luang Pu Khao Analayo. Even though at the age of 92 when the medals were consecrated, Luang Pu Khao was mindful at all times and his practice showed through his actions. It was believed that at the time nobody else could match Luang Pu Khao in terms of his mindfulness and high meditation practice. It was decided that Luang Pu Khao’s image was to be used for the medallions since he was widely accepted by the public as a great master of his time. Crown Princess H.R.H Sirindhorn was also invited to inscribe her signature on the reverse side of the mould, making the medallions of this batch officially recognized by the Royal family and also to bless the public with prosperity due to the involvement of a Royal family member. The last blessing ceremony for this batch of medallions was held in Wat Bowornnives on Saturday, 1st of July, B.E.2521. Khunpaen Luang Phor Tim Wat Phra Kao BE2547. Nur Phong with Silver takrut, made 700 pieces only. It comes with original temple box. Rian Pikanet Wat Donsala BE2529. Nur loha pasom. Blessed by Phor Than Kling, Archan SiNgern and other monks from Wat Khao Or on 5th December BE2529. Second batch Rian Gai Fa Luang Phor Suang Wat PromSawat BE2553. Copper material. It comes with original temple box.